"President" follows Jang Il-Joon (Choi Soo-Jong) as he runs for the 18th presidential office in 2012 to actually winning the election. 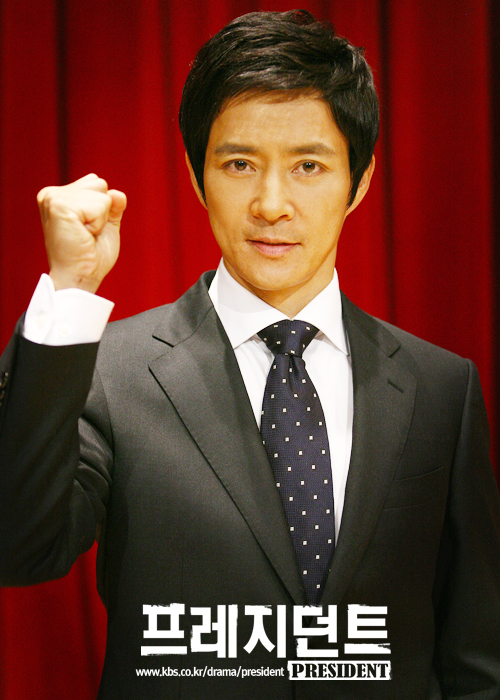 Jang Il-Joon was born from an ordinary educator family, but graduated from a prestigious university as a law student. When the country was under military leadership, Jang Il-Joon was a student activist and became involved in a once-in-a-lifetime case. He dreamed to become the new dream for Korea. Since then he has worked as a three term lawmaker and a human rights lawyer. Now, Jang Il-Joon throws his hat into the 2012 presidential election, dreaming to overcome conflicts between ideology, class, and regions with his leadership. "President" will take over the KBS2 Wednesday & Thursday 21:55 time slot previously occupied by "Fugitive" and followed by "The Thorn Birds" on March 2, 2011. Based on the Japanese manga "Eagle" by Kaiji Kawaguchi. The original "Eagle" manga depicted the life of an Asian-American senator as he runs for president of the United States. Paul Wrightsman May 07 2017 6:52 pm My wife and I just finished a marathon viewing of The President on NETFLIX. We found the plot to be very plausible, the characterization quite believable and the acting superb. Unfortunately, these are attributes that seem totally absent from the majority of Korean serialized dramas. Generally, writing is sloppy and dedicated to just dragging out the series to fill air space. Characters change personality at the spur of the moment; supposedly intelligent people make stupid devisions, just for the sake of adding additional episodes, and the final ending is filled with contrived sweetness and light. It's hard to believe that writers and staff are actually being paid for such blatant incompetence. Nocturnalux Dec 18 2015 8:40 pm This one was a bit all over the place. Whatever happened to the daughter? I swear they completely forgot about her. Her father gets shot, nearly dies, then goes to win the election amidst a lot of furor and she does not appear nor is she even mentioned again. They could have easily told the same story without her but she was introduced as a character so utterly dismissing her mid-story, without as much as an explanation, shows very lazy writing. I was glad that the romance was very toned down as it could easily have ruined what should primarily be a political themed story. But overall I wasn't all that impressed by this, Assembly was much better. ty Mar 08 2015 8:25 pm one of the best korean drama,i hope i get to see continuation and see how president Jang will rule and handle his regimei enjoyed watching the show. SuperKorean13 Jan 27 2012 3:35 am LEE SUNGMIN!!!! superangel Aug 20 2011 11:14 am SUNGMIN-SUNGMIN-SUNGMIN-SUNGMIN~ i watch this drama only because of sungmin.. super junior's sungmin, fighting!! shaira agbayani Jul 20 2011 9:47 pm I love sung min hes so cute !!!!!!!!!!!!!!!! leann Apr 03 2011 12:06 am yah! yahh! THEY WATCH THE DRAMA BECAUSE SUNGMIN WAS THERE? MyCo Feb 12 2011 5:27 pm Hey near the end of episode 7. The guy is walking back home by himself singing a song about "the sun will rise again tomorrow" Does anyone know the name of that song? Niena Fishy~ Jan 08 2011 10:27 pm the song used at the end of this drama, who is the singer and what's the title of the song? HaeNa Jan 05 2011 6:31 pm wat's sung min's role in the drama?